One of Mike’s favorite treats are Triple Chocolate Malted Cookies. He also loves Whoppers candies. Actually, he is pretty much crazy for anything chocolate malt, so I thought it would be fun to make a special dessert with this favorite in mind. I wanted to make a dessert for two, and Chocolate Malt Bread Pudding jumped to the top of the list…for obvious reasons. Chocolate Malt Bread Pudding starts with bread cubes – I just used a leftover baguette. Then add some chopped Whoppers candies, chocolate chips and drizzle chocolate syrup over the top (yum!). Next whip together a light custard (I just toss these ingredients in my Magic Bullet), pour it over the top and bake! Chocolate Malt Bread Pudding could not be any easier to make, using simple ingredients that you can have on hand at all times. The result is a rich, decadent dessert for two that puts a fun twist on a malt shop favorite. Preheat oven to 325°F. Generously spray 2 8-ounce ramekins with cooking spray. Place bread cubes in prepared ramekins. Add chopped malted milk balls and chocolate chips, and then drizzle each with chocolate syrup. Put milk, cream cheese, egg and malted milk powder in a blender and process until smooth. Pour over bread cube mixture. Bake for 25 to 30 minutes. Remove from oven and let cool for 10 minutes. Serve with a dollop of whipped cream or vanilla ice cream, if desired. 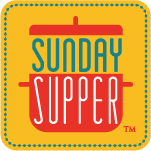 With Valentine’s Day coming up, the Sunday Supper group had a fun idea for the theme this week. We are sharing recipes that would make a special Valentine’s meal for two. From appetizers to entrees to desserts and drinks, we have you covered for cooking a special meal for you and a special someone. LOL Kim 🙂 Thank you so much for your kind words…you made my day! There you go sharing the perfect recipe for me and my husband. He loves bread pudding and I love chocolate. Excellent! Bread pudding has recently become one of my favorite desserts. I’ve never had a chocolate malt one, it sounds toooooo good! oh my gawd, I LOVE this!!!! so inventive and easy and looks absolutely delicious!!! Pinned!!!! can’t wait to make this! Drooling!!! I love it! It has everything I like in it, chocolate and bread! Your recipe couldn’t be more perfect!! I LOVE Whoppers! This is a must-make for me! Oh, I’d be nervous to bring malted milk balls into my house…not sure they’d make it into the dessert 🙂 I adore bread pudding, though, so would do my best to save enough for your yummy version! This looks amazing and malt balls — how creative! Yum! I love bread pudding! This one is so decadent and gorgeous – thank you for sharing this recipe!